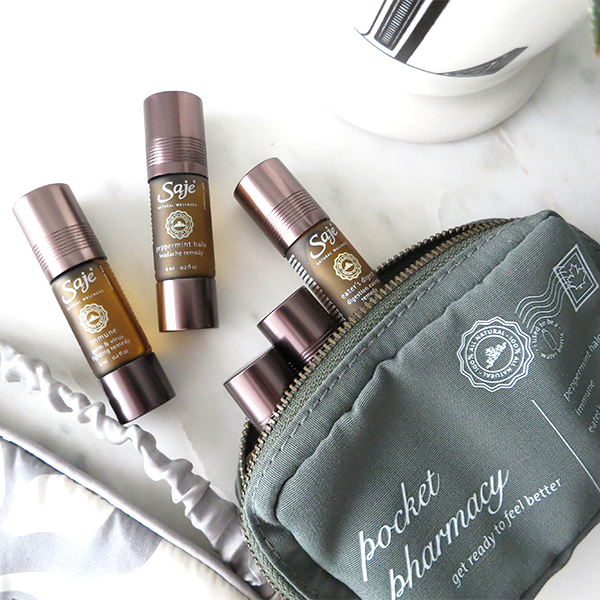 Ever the skeptic, I was doubtful I'd be using Saje Pocket Farmacy ($59.95) that much when I received it in my Pure Barre goodie bag months ago. 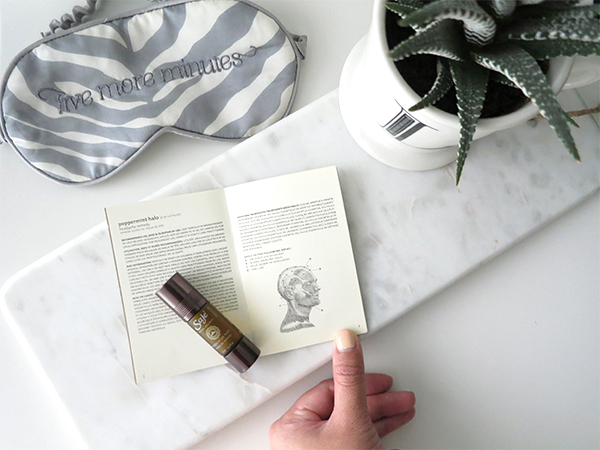 How could a little case of 5 roll-on aromatherapy vials treat all sorts of ailments ranging from headaches and indigestion to stress, muscle pain, and cold and flu symptoms? But fast forward 6 months and Saje Pocket Farmacy has become an indispensable part of my everyday routine. I've since had many opportunities to test each and every remedy in the zip case multiple times and I can attest they really do work. 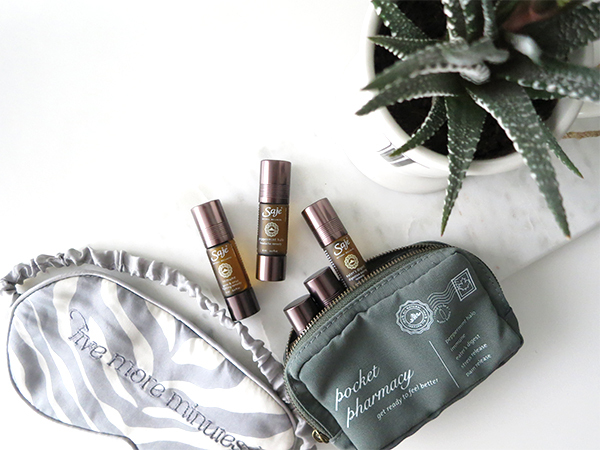 Pocket Farmacy bundles together some of Saje's most popular aromatherapy remedies into an ultra-portable, convenient little zippered case. Elasticized loops hold every roll-on vial in place inside. There's even a handy booklet with instructions, a full list of ingredients, and diagrams for where to apply each treatment. I usually keep the Pocket Farmacy in my nightstand, but if I'm traveling or not feeling well any given day, I'll pop it into my work tote or my weekender bag. The remedies themselves are all-natural with potent, invigorating scents. Aside from the uplifting aromas though, the essential oils in each blend ease ailments by creating specific sensations when applied. Immune soothes cold and flu symptoms with its blend of eucalyptus, cinnamon, myrrh and peppermint. I like how the scent of this one is slightly citrusy, and the eucalyptus and peppermint help clear up sinuses and respiratory and nasal passages for instant relief. It's so effective at clearing up congestion I've been using it as temporary natural relief from my allergies. Works like a charm. Eater's Digest has been a true lifesaver on the rare occasion I've been stricken with indigestion. I'm not as fond of the scent of this one as the others because the fennel oil in it has such a strong smell of licorice, but it does such a good job of soothing an upset stomach I'm not going to complain. I have vials of stress-fighting oils on my desk at home and at work, so I'm no stranger to these types of aromatherapy roll-ons. But Stress Release is different because aside from being applied to the pulse points and across the forehead, it can also be applied to the soles of the feet. Sounds gimmicky, but when I tried it before going to bed I found it was very effective at drawing tension out of the body. Out of all the remedies in the Pocket Farmacy, Pain Release gets the most use. I roll this analgesic, muscle pain-relieving oil on sore muscles after barre and massage it into the husband's neck and shoulders if he's had a brutal kickboxing class. After the 3-hour kayaking trip during my stagette, my MOH and I both rolled this on our neck, shoulders, and arms to relieve the soreness we could feel forming. It instantly numbs pain and then heats up to the touch. For even more pain relief, I'll layer Peppermint Halo on top to cool and soothe—sort of like an all-natural version of Icy Hot. For a girl who didn't think she believed in the lofty promises of Saje Pocket Farmacy, I've sure been using mine a lot on myself (and on others as well! ), yet the 6 ml vials have been slow to run out. When they do though, I'm going to replenish each remedy because as I've learned, they truly do help with what ails you. Have you tried any of Saje's products?